I frequently get told that the reigning Diversity ideology couldn't have had any effect on the mortgage meltdown because A. Minorities are, by definition, a minor, insignificant part of the population. B. Minorities don't have any money so they can't lose much money investing foolishly. Instead, I'm told, the California disaster was all the fault of Ed McMahon for defaulting on his Beverly Hills mansion. Of course, the biggest single problem was likely that loosening credit standards to add 5.5 million more minority homeowners (as President Bush demanded in 2002) loosened credit standards not just for minorities but for everybody. But the minority contribution alone was significant. And it's crucial to understand this because it's only going to get more significant as the population of Hispanics increases by about 100 million from 2000 to 2050 (according to Pew Hispanic Center projections). There are now 100 million minority individuals in the U.S., and while they may or may not have much money, they certainly took out a lot of dubious mortgages in the housing bubble, expecially in California and a few similar states. One off the things I've been trying to explain is that the late mortgage bubble was so crazy because, unlike most bubbles, it was not a bet on the rich getting richer (as in the Internet Bubble). Betting on smart young people to invent new Internet stuff wasn't nuts — they actually did invent a whole lot. The nutty part was that there weren't many ways to use an open system to achieve a quasi-monopoly and earn above normal returns on investment.profit from the inventions. But the housing bubble was a bet on the increasing ability to pay of the part of American society — the working class and lower to middle-middle class, primarily — that has been getting the fuzzy end of the lollipop since about 1973. It was a bet on the bottom 3/4th or so of American society, in particular on the second quartile from the bottom, because that's where the incremental homeowners needed to push the home ownership from 64% to 69% would primarily come from. I'm a strong advocate of the well-being of the bottom 3/4ths of America, but that doesn't mean I ever saw much evidence that they were substantially increasing their ability to pay back massive mortgages. It was all just nuts. Palmdale and Lancaster are in the high desert about 60-75 miles north of downtown LA. Home prices were cut in half there from 2007 to 2008. These three million dollar homes are likely to collapse in price, too, at some point. Still, think about the ratio between the top and bottom in LA County zip codes at the end of the housing bubble in July 2007: $2.5 million median prices in the 99th percentile zip codes vs. $250,000 to $300,00 prices in the 1st percentile zip codes. A ten to one ratio of home prices between the 99th and 1st percentile in LA County, one of the most unequal places in America, is not very much at all. It's a much narrower gap than in non-home wealth. Also, note that the most expensive zip codes aren't turning over as fast as the least expensive, so mortgages originated during the carcinogenic years of the bubble don't make up as large a proportion in the high end zip codes as they do in the low end zip codes. There were a lot of people furiously flipping houses in Lancaster to put them on the road to one day moving up to Beverly Hills. But the folks in Beverly Hills already were living in Beverly Hills, so the urge to speculate wildly on their houses wasn't as pressing for them. Buying a house in Beverly Hills for millions of dollars is a bet that there will always be stars and other rich people with lots of money who'd like to live in Beverly Hills with the other celebrities. That proved to be a fairly good bet during the Great Depression, and a great bet ever since. Buying a home in Lancaster-Palmdale for hundreds of thousands of dollars, however, was a bet that people who work in big box retail store will somehow make dramatically more money in the next decade or two. ANNOUNCER: Bud Light presents real men of genius. Real men of genius. Today, we salute you, Mr. Giant Taco Salad Inventor. UNIDENTIFIED MALE: Mr. Giant Taco Salad Inventor. ANNOUNCER: Ground beef, refried beans, guacamole, cheese, sour cream, and if there's any room left, a few shreds of lettuce. A culinary creation that baffles the human mind. A 12,000-calorie salad. Ay carramba. Some may ask, is your taco salad healthy? Of course it is, it's a salad, isn't it? [If you're still hungry] you can eat that deep fried crunchy bowl. There are 88 different cities in LA County, which is home to over 3% of the country's residents, and nobody can be expected to know, say, Bellflower from Bell Gardens. So, I'll stick to Real Homes of Genius from one low-end municipality that you might have heard of, Compton, home of the Crips gang. This is where the original West Coast gangsta rappers, NWA, were straight outta. Although world-famous as a black ghetto, already by the time of the 2000 Census, it was 56% Hispanic and no doubt was increasingly Latino all through the Housing Bubble. Here, for example, is an 828 square foot manse on a 5,000 square foot Compton lot, with one bathroom, built in 1954. (The average size of a new house in the U.S. is 2,349 s.f.) Maybe it doesn't look like much, but you do get a high rise security fence and it probably would only cost a few thousand to top your fence with the now fashionable lethal finials. On 11/05/2003, it sold for $110,000. On 9/30/2004, it sold for $235,000. On 12/22/2005, it sold for $310,000. Of course it would appreciate $100,000 per year. Just look at it. The median household income in Compton was $31,819, so you could make three times as much money per year just by living in your house as you could by going outside and working for a living. But that's nothing. Here's a 500 sq. ft. one bedroom - one bath Compton house built in 1939. 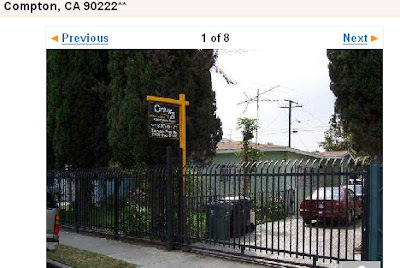 It sold on 9/27/2007 for $340,000. Think about that. That's $680 per square foot of 68-year-old wood frame construction. In Compton. By August 2008, less than a year later, it was on sale for $97,900, a 71% price cut in less than a year. What happened to all the money that people in Compton made selling these Real Homes of Genius to each other? A few wise oldtimers presumably bailed out and retired to the South with the profits from selling their Compton homes to Hispanic newcomers. A few clever youngsters probably sold out at the peak and rented homes for $900 per month. A lot of the money, of course, went into buying new Real Homes of Genius. But, I suspect the worst problem is that a lot of people wound up spending the money on consumer goods. In fact, plenty of people probably spent money they assumed they'd make eventually off selling their homes to support a lifestyle that can't be supported. And that's going to require a nasty contraction of the real economy to work out. Beyond that, the global financial markets concocted vast leveraged contraptions on top of these absurdly leveraged no money down Compton mortgages.